The U.S. average retail price of diesel jumped 7.2 cents to $3.385 a gallon as oil prices remained at levels not seen in four years over supply concerns. The increase was the seventh consecutive weekly rise for diesel, and the fuel has risen 17.8 cents a gallon since Aug. 20. Trucking’s main fuel costs 60.9 cents a gallon more than it did a year ago, when the price was $2.776, the Department of Energy reported Oct. 9, the day after the Columbus Day holiday. The average price was up in all regions — and highest in California, reaching $4.111 a gallon. The national average price for regular gasoline rose 3.7 cents to $2.903 a gallon, according to DOE’s Energy Information Administration. The average is 39.9 cents higher than it was a year ago. The average gasoline price rose everywhere except the Rocky Mountain region, where it dipped 0.1 cent. The steepest increase came on the West Coast at 6.3 cents a gallon. At the same time, Hurricane Michael hit the Florida Panhandle on Oct. 10 as a Category 4 storm with winds of 155 mph and was the strongest to make landfall there in more than 100 years. On Oct. 9, about one-fifth of oil output in the Gulf off to the west was shut down. The hurricane was expected to sweep northeast into the same areas that Hurricane Florence drenched and disrupted about a month ago. The 2018 Atlantic hurricane season produced 14 named storms as of Oct. 9, including seven hurricanes. Meanwhile, in California, one carrier is adapting to diesel price spikes. 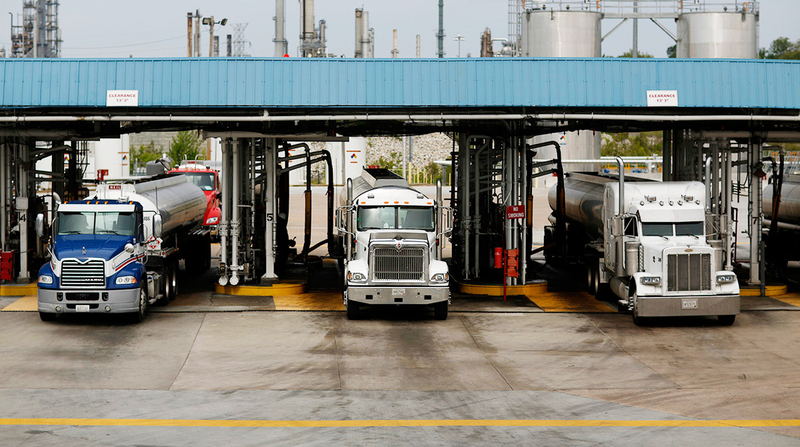 The company has advantageously priced fuel delivered to its terminal, has ordered electric trucks and is lined up to test another truck maker’s electric models, too. “The majority of our fuel is bought in California. Fuel cost is always a challenge,” Joe Finney, chief operating officer for Dependable Supply Chain Services, told Transport Topics. “We negotiate our fuel deliveries and wet hose [from fuel trucks at] all of our locations and as many of our tractors as we can. We purchase fuel outside on a limited basis,” Finney said. The fuel trucks can come twice a day at Dependable’s bigger locations, no matter the hour, Finney said. Dependable’s less-than-truckload business is its largest division, and the Los Angeles-based company operates about 600 Class 8 trucks, mostly day cabs, and 50 straight trucks and uses about 300,000 gallons of diesel each month. Dependable is looking at more alternatives to diesel after trying liquefied petroleum gas, too. The carrier put down deposits on 10 battery-electric heavy-duty trucks from Tesla Inc. “There are some [state] grants aimed at zero-emissions vehicles that we looking to take advantage of,” he said. Meanwhile, globally, supplies from Iran and Venezuela have been shrinking, creating a risky situation for the world economy, International Energy Agency Executive Director Fatih Biro said, according to a Bloomberg News. U.S. sanctions on Iranian oil exports are hitting much harder than most people predicted, Bloomberg reported executives from the world’s largest energy traders said. Perhaps 2 million barrels a day of Iranian crude could be lost to the global market, said Jeremy Weir, CEO of Trafigura Group Pte. While other traders, including Vitol Group of Cos. and Gunvor Group, saw the impact closer to 1 million, that’s still twice as much as most analysts initially predicted. Petrochemicals — components derived from oil and gas that are used in daily products such as plastics, fertilizers, packaging, clothing, digital devices, medical equipment, detergents and tires — are becoming the largest drivers of global oil demand, in front of cars, planes and trucks, according to a recent IEA study. Crude oil futures trading on the New York Mercantile Exchange closed Oct. 10 at $73.17 per barrel compared with $75.30 on Oct. 1. In related news, President Trump plans to change U.S. policy to allow the sale of so-called E15 fuel — which contains 15% ethanol and 85% gasoline — year-round. The U.S. Environmental Protection Agency, which regulates air pollution from gasoline, blocks the sale of E15 from June 1 to Sept. 15 in areas where smog is a problem.